Hot Garage? The WindeeVent Garage Ventilation System reduces air temp and decreases toxic fumes (READ MORE). Warranty Alert! It is crucial that the end customer and/or installers register’s your SR1800, if you would like to have warranty (READ MORE). The SR1800 Solar Attic Ventilation Fan is HANDS DOWN the best solar attic fan solution on the market! Proper Attic Ventilation – IS CRUCIAL! 1. The kitchen cooks the food. 2. Your attic cooks the house. The hot attic acts like a huge radiator, transferring heat into your living spaces, sending both utility bills and temperatures soaring. Utilizing solar attic ventilation fans in closed spaces and storage areas is important. Proper ventilation (ventilation benefits) should create continuous air circulation and helps the space maintain, as close as possible, the same ambient temperature as the outside temperature. If you’ve ever been in your attic or enclosed spaces, you know just how hot the space can get, because the sun beats down on the roof surface and heats up the stagnant air inside the attic. Therefore, most building codes require homes to have a passive venting system like ridge vents, gable vents, or dormer vents. However, passive ventilation does not provide the pressure needed to force the air through the attic and outside. According to the Home Ventilating Institute, passive ventilation works via a process called ‘convection‘. Convection starts at about ~128 degrees fahrenheit and to obtain true convection so that the system works properly, this requires that your attic temperature reaches an average of 138 to 142 degrees fahrenheit. Even at 142 degrees fahrenheit, assuming your air intake is balanced your system would only complete 2 to 3 air exchanges per hour which are better than nothing but not enough to keep your attic as close to the ambient temperature outside. Reducing heat buildup in your attic which can reach 165-185° fahrenheit on hot summer days, and moisture in the winter, are the two main goals of solar powered ventilation. Heat and humidity can also weaken the home’s structural integrity and cause interior finish, drywall and exterior paint failures. The high cost of energy, home repairs and maintenance should be incentive enough for homeowners to properly ventilate their attics. The purpose of attic ventilation is to equalize temperatures inside and outside the attic throughout the year. In summer, this helps make the living areas beneath the attic cooler and, therefore, more comfortable. This also helps reduce how hard the air conditioner needs to work, thus lowering its operating costs. This counterbalance also helps reduce the heat that will distort and destroy roof shingles and cause the premature deterioration of roof boards, sheathing, siding and insulation. In winter, proper ventilation helps to prevent moist air, which seeps into cold areas, from condensing on the underside of the roof surface, beams and rafters. This condensation can cause mildew, rotting of wood and excessive rusting of fasteners and other metal components of the roof structure. Excess condensation creates wet insulation, which diminishes its effectiveness and in sufficient quantities may damage interior ceilings. Proper ventilation can also help prevent the formation of “ice dams” in the winter by equalizing the indoor and outdoor temperatures. Ice dams occur when snow hits a part of a home’s roof warmed by heat loss from the interior. The snow then melts and freezes at the eave area of the roof, where it’s colder. Therefore, the mounds of ice and snow often drip and form icicles. That’s where a motorized fan comes in. A solar attic fan placed close to the roofs ridge will pull air in from outside (through the soffits and/or other means of net free air intake source), then force it to move through the entire attic space and escape through the attic vent. The goal of converting from passive to active ventilation (solar attic fan) is to have 10-12 complete air exchanges per hour. 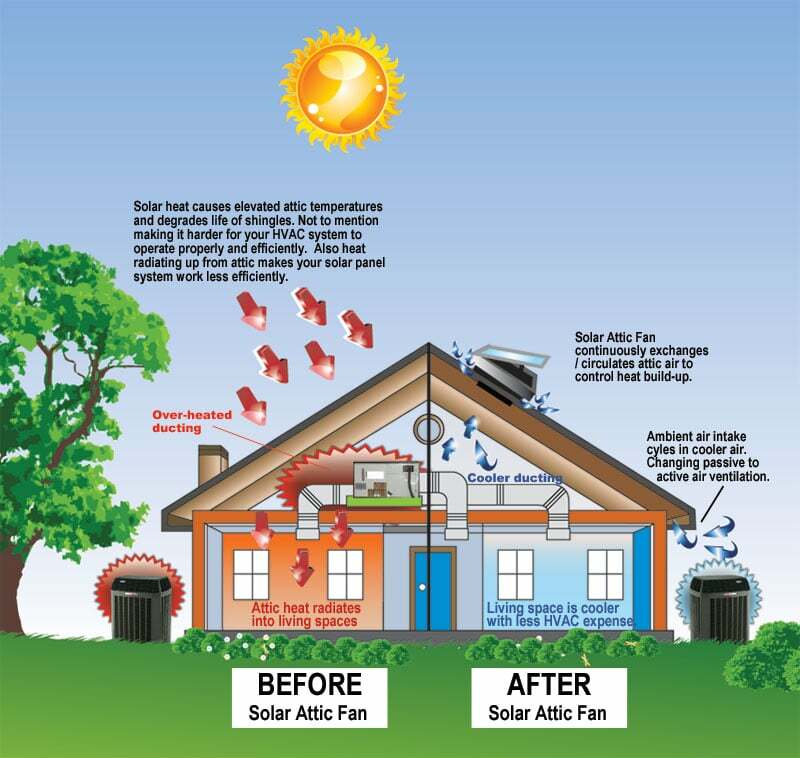 So, in summer months, a solar attic fan can reduce the temperature in an attic by up-to 40°F! Also, since the solar attic fan does not require electricity, it utilizes the sun to operate thus not costing you anything to run and also offers additional benefits. How should the solar attic fan be oriented? There are various types of intake. The air being exhausted must be replaced by outside air drawn through unobstructed air vents. These soffits are normally found under the eaves on a home. However, the key is that for air to properly be exhausted, the intake must be cleared, regardless of application. To calculate the total minimum vent intake area in square inches, divide the CFM ratings of the solar ventilation by 300 and multiply the result by 144 which will give you the Net Air Intake as recommended by hvi.org. So, here is a calculation demonstration: (1300 ÷ 300) 144 = 624 net air intake required. Then the Solar Royal Attic Fan moves up to ~78’000 cubic feet per hour. The intake must be balanced for it to do it’s job. ~4.2 sqft of Net Free is suggested per fan. Additional Cost Benefits: One of the best features of a solar attic fan is the cost savings. Please note that this is only an estimate, however it gives a clear comparison of solar fans vs. electric ventilation. The figures also do not take into consideration the energy savings from keeping your attic cooler. • SR1800 Premium Solar Attic Fans. • Whole Home Surge Supression. • Attic Insulation Removal Bags. • "We have a product that is by far the best solution on the market." • "Smartest and well thought-out product we have ever used. Easy to install and offers the best value & quality." VALUE AND EASY OF INSTALLATION. Hands down, these are the biggest compliment we can get and the SolarRoyal team members are industry leaders in bringing the best sales and support together. We offer partner training events, trade-show support or customized bids support. OUR SALES TEAM & PARTNERS ARE THE VERY BEST!